Making Things Smart shows you how to make simple hardware with everyday materials, and then make it do amazing things with an Espruino microcontroller. No software needed - get started in seconds with Web Bluetooth! 128kB RAM, 512kB flash. HTTP, HTTPS, Websockets and MQTT on-board. With Maps, Dynamic Arrays and Objects out of the box. Just plug in and start creating in seconds. 5 different devices offering a range of functionality! WiFi, Bluetooth, and even Micro SD cards. A large selection of tutorials, all searchable and indexed by the hardware they use ensures that you're up and running in no time! The Pico's small size and castellated edges make it easy to embed in your product, drastically reducing development time and cost. Embedded computing that's about as easy as it gets. The TTB "Time To Blink" of the @Espruino board is phenomenal. Love the Chrome Web IDE. Got my @Espruino running nicely in 15 mins on Win 8.1. This is the perfect hardware to introduce students to ICT in schools. "The Language of the Web" is used everywhere - your laptop, phone, TV, and the servers that power the internet. 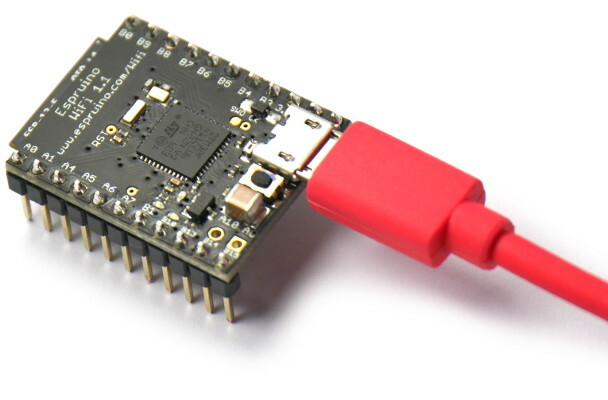 With Espruino you can use it on a low power microcontroller too! Hardware (CC-BY-SA), software (MPLv2), and documentation. Add functionality, tweak it, or just browse and see how it works. Everything on one chip for the lowest power consumption. 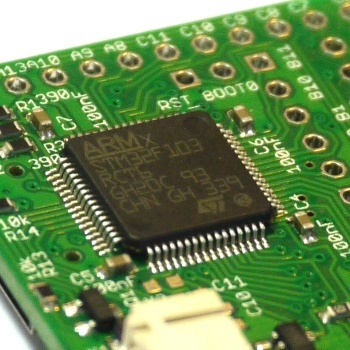 Espruino has everything it needs on a single chip. This makes it affordable, reliable, and power efficient - allowing it to run for years on a battery. Espruino boards use Bluetooth LE or plug in to your computer by USB. No drivers, no special software. Just open a terminal app and start writing code! It installs in seconds and provides a modern Syntax Highlighted editor with code completion and even debugging. It even automatically loads any modules you need from the internet. 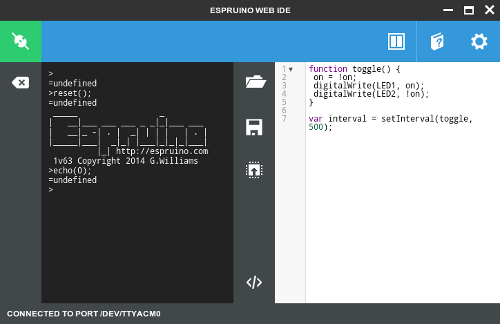 The Graphical Editor lets you use Espruino even if you can't code! The optional graphical editor makes it quick and easy to create simple devices, even if you've never programmed before.